In America 2018, three issues aren’t controversial for brands to champion: civil rights, criminal justice reform, and LGBTQ rights. Here are three issues that are: abortion, anthem protesting, and immigration. Gun control is somewhere in the middle. These are the findings of a new Morning Consult report that reviews what Americans expect from brands when it comes to some of the most significant corporate ethics and political questions of the day. Another key finding: Supporting anthem-kneelers will draw the most passionate response from Trump voters. The chart below gauges partisan enthusiasm around central political issues. Each data point represents the percentage of Trump voters who are either much more or much less likely to have a favorable opinion of a company if they took a certain position. If the much more likely number was higher than the much less likely one, then that data point is displayed, and vice versa. 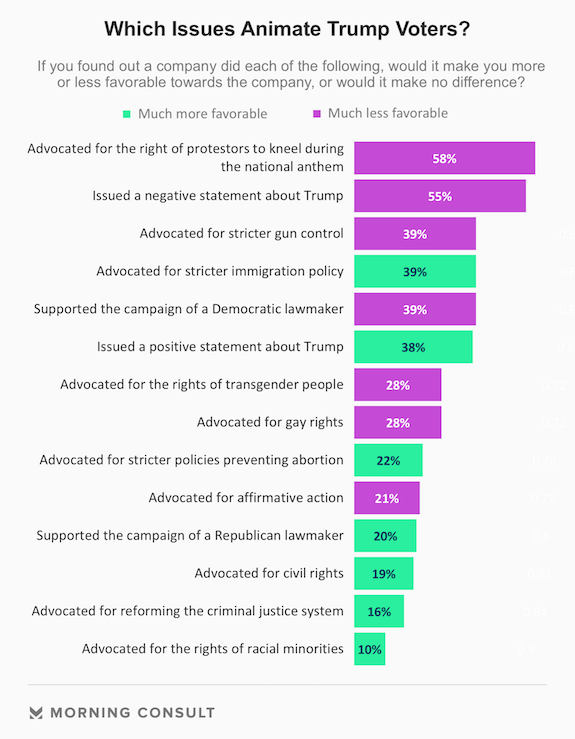 This means that anthem kneeling is the issue where Trump voters are most likely to have a strong opinion, and advocating for the rights of racial minorities is the least. What positive publicity opportunities will consumers most appreciate? Which demographic groups are most likely to boycott? 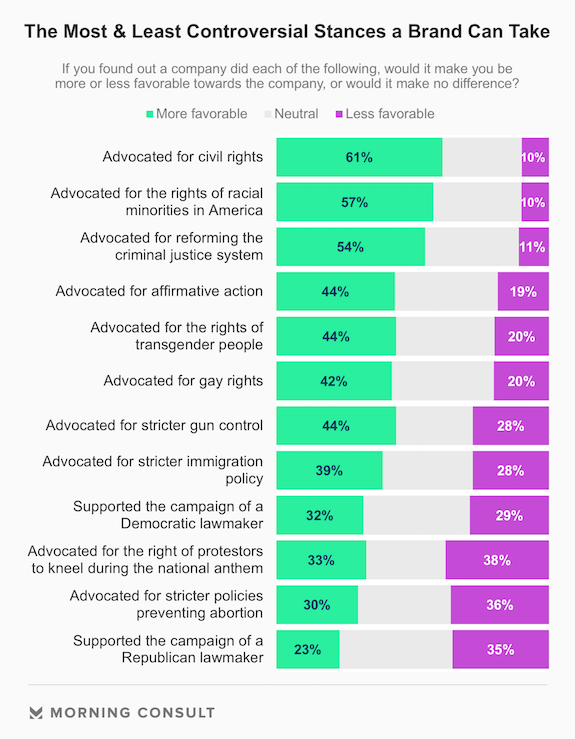 What are the most controversial political issues for brands to support? Which companies do Americans see as most ethical?